Another in our ongoing series of reviews of cigars given to us by the good folks at Cigars Direct. 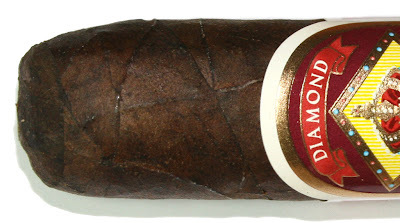 Featured this time is the Diamond Crown Robusto No. 4 Maduro, given to us back in the Spring of 2009. Produced by Tabacalera A.Fuente y Cia. for the Newman Family, it features a dark, rich looking Connecticut broadleaf wrapper and leaves some of which have five years of age on them. Following Cigar Aficionado's 4-part rating system (Appearance & Construction, Flavor, Smoking Characteristics, and Overall Impression) I sat down to rate this cigar while enjoying a glass of bourbon. 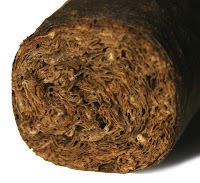 The beautiful dark wrapper gave pre-light aromas of clove, while the foot smelled of cedar. The draw was a bit firm for my liking, but it certainly didn’t interfere with the burn which was stellar through the entire experience. In fact, it was one of the best burning cigars I’ve seen. The smoke was a bit thin, undoubtedly a product of the tight draw. The ash was quite strong, never falling, and requiring a bit of effort to ‘break off’ now & then. The flavor started out like smooth wood. About an inch into it, leather was hinting every so slightly. The mild profile had me intrigued having mostly enjoyed stronger cigars lately. Later a gentle spice teased me a bit as well. At one point I even had hints of dark berries. In the end, I found it a little dry on the finish, occasionally metallic. Finally, it warmed to a dry, slightly bitter, conclusion which left me feeling like I needed to try more, one of these days. My rating for the Diamond Crown No. 4 Maduro is 86. Thanks to Cigars Direct for giving us the opportunity to try this cigar. Give the Diamond Crown maduro a try.